The building of a new Church in Brothertoft Road was a symbol of hope for the future. It came with the new spirit in Methodism with the uniting of the four main Methodist denominations in September 1932. A small mission housed in a corrugated iron building (affectionately nick-named 'The Tin-Tab') next to the garage on Brothertoft Road was the only place of worship to the west of the railway in a fast-growing area. There were two chapels in West Street: an ex-Primitive Chapel and an ex-New Connexion one (called Zion). It became evident that to maintain two chapels within half a mile of each other while the growing western suburbs were almost uncatered for, was wrong. As the ‘Tin- Tab’ site was unsuitable for modern devel­opment, a larger site was secured in Brothertoft Road (opposite Sydney Street) for £566. It comprised a pasture field occupying 4 acres 2 rods and 38 poles. At first there was only enough money to build the Church, but this was designed as a dual purpose building for use as a place of worship and school room. The old 'Tin-Tab' building was retained on its old site for many years and continued to be used for work with young people. In due course an offer for its site was too good to be refused. It was suggested that the building should be dismantled and re-erected in Zion's grounds. This proved to be a problem and experts said it would never 'go together again'. In the end it was transferred on rollers to a prepared foundation at the rear of Zion, where it continued to give loyal service. The two buildings on one site were symbolic of a wonderful union between two societies and traditions, inspired by continual address to God and a willingness to carry out His wishes. It cost £3,864 to build, in addition to £150 in fees to the architect Mr. Hedley A. Mobbs, and was insured for £4,500. The organ was moved from the old Zion Church, completely renovated and rebuilt with a modern detached console and electric pump for £300 and insured for £1,000. The final services at Zion Church, West Street were held on Sunday 30th September 1934, the Church Anniversary. The Early Years During the first decade much hard work went into paying off the debts on the new building and organ. In 1944 the building was free of debt. Between 1946 and 1949 the special efforts committee raised enough money to form the base for the New Building Fund Committee. It first met in November 1949 and completed its task seven years later with the opening of the new hall costing nearly £9,700, on 29th November 1956, free of debt!! During these years all the Trustees and officers were men. It was not until 1967 that Muriel Baxter and Nancy Smith became the first women trustees. Many events took place with large scale affairs being organised by the whole church and rich rewards were reaped by all. Once again the church outgrew the buildings. Many children and young people have passed through the doors of Zion and in the 1960’s the rooms were full to overflowing at times and the third phase was planned. Three rooms were built onto the existing church and entrances enabling the four departments of Junior Church to each have their own rooms. 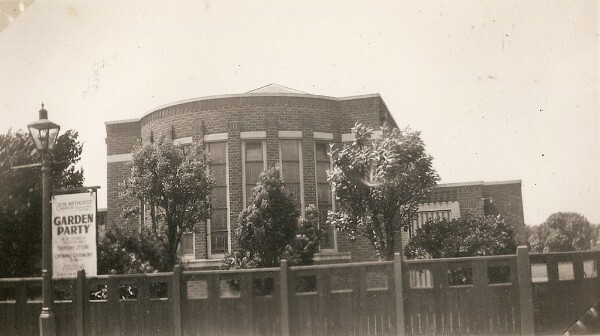 The tin tab was in need of replacing, so the Junior church met at Allan House on Carlton Road while the building work was taking place, just as they had many years earlier at the old Carlton Road school. These new rooms were opened in 1969. The latest phase, recently finished, saw the refurbishment and decoration of the worship area, a new kitchen, coffee lounge and disabled facilities added. Just as the work was nearing completion the hall roof, built in 1956, collapsed and once again fund raising had to go on to renew the roof. The church is now as always used in many ways and by many church and community groups. The vision that started many years ago is still being fulfilled today.